Jennie Boisvert - Councillor for Clarence Park Ward: Millswood Station; Where are we now? This small committee met again last night to discuss where we are at and a way forward. We're not quite at election time yet but getting some promises from politicians is a step in the right direction. To this end John Gasper (chairperson) has been promised a meeting with Tom Koutsantonis to be organised by Stephanie Key MP. However, the meeting is yet to occur and in the interim the committee will send him a letter outlining our concerns and again requesting a meeting time. I have met with Vickie Chapman, Shadow Minister for Transport and outlined our ideals. 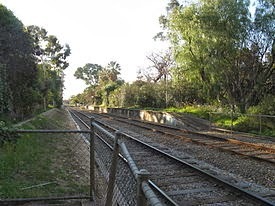 We discussed the original reasons for closure and how using the station fits well with the current public transport strategy and 30 year plan for Adelaide. She was a sympathetic listener and showed great interest- no promises though! A public meeting will be held in late November or early December for all persons now on our data base and everyone else who would like to use this service if it is reinstated. In the meantime we have been led to believe the Minister is getting some research done and we are still hopeful of a positive outcome.